As I said before, the most interesting thing about the Alpha 7 is its short flange focal distance (FFD, more information here), it's 18mm only. So there is plenty of room for adapters. FFD for Leica screw mount (often named M39) is 28.8mm, the other more common FFDs go from 40.5mm for Konica AR, 42mm (old canon FD/FL), 44mm for Canon EOS and Sigma, 45.46mm for the famous M42 screw mount to 46mm Olympus and 46.5mm Nikon F (more information here). There are adapters available for most of the common mounts, in my opinion, for a try, some cheap one would do. An adapter with contacts for Canon is more expensive, check, whether the adapter is for full frame and be prepared: autofocus will be slow or simply not working. The most expensive adapters are the Sony LA-EA3 and the LA-EA4, the first without autofocus, the second has its own autofocus built into the adapter, hence its size. If you own Sony or Konica/Minolta A mount lenses, the investment is reasonable, seen the prices of full format E mount (FE) lenses. A warning for the Canon adapters with contacts: they work fine with original Canon lenses. It may not be the same for third party lenses with Canon mounts. I have tried several older Sigma Canon mount lenses that do not close the aperture. Such a lens works fully open, but when you close the aperture on your Sony, the camera thinks you did, but the lens didn't, so photos are overexposed. Autofocus works, but is slow. Rumours say that Sigma hadn't access to the full Canon lens protocol. I have tried two more adapters with the same negative result. These Sigma lenses do not work at all with Canon DSLR cameras, the camera gives an error message. Some lens sellers "forget" to mention this. So ask the seller whether the lens works with a digital Canon. Some information for Russian and other eastern lenses, including the adaption of M39 Zenit mount lenses, is on this page. You will find some hints for Braun Paxette lenses which have a similar problem on another page. Front row: 3 different M42, 2 different Leica Screw Mount (LTM or M39, much smaller than the others due to the short FFD). Middle row: Canon EOS with contacts, M39 to M42 ring, T2 Adaptall to M42, 2 different M39 to M42. Last row: Exakta, Contax RF (Kiev), Olympus OM, Sigma, Minolta MD. 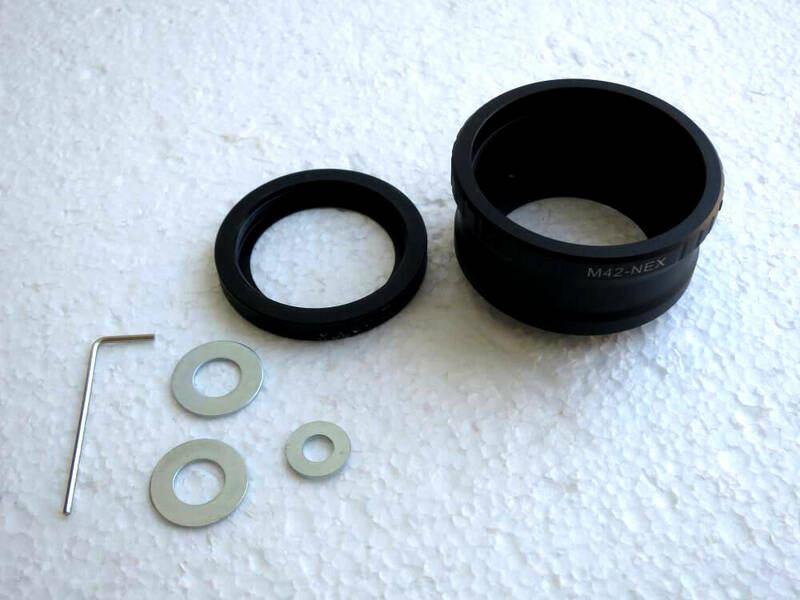 The 3 M42 adapters in the first row have all slightly different FFD sizes, the middle one is about standard length, the left one is a bit longer and the right one is about 0.3mm shorter, hence perfect for M39 Zenith adaption (see Russian lens page). The 2 M39 adapters are also differently made, the left one has a slightly protruding ring. This could be an advantage for Zeiss or Russian collapsible lenses. They have a tiny knob, that has to be pushed in to set the lens to infinity and lock it there. If this knob touches the adapter, you might have to cut out a little "groove" for the base of the tiny knob. With a protruding ring you have just to file off a weeny bit of the base of the knob. The Contax RF or Kiev RF Mount adapter is a bit difficult to find, but there are skilled people who make them in Russia and other Eastern countries. Contax mount is quite different. In fact it's two mounts. 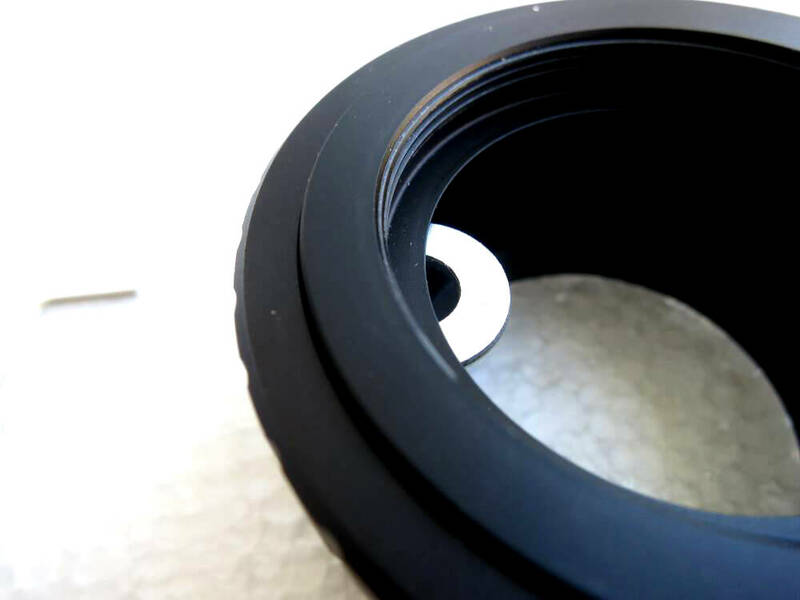 The inner mount has a focussing helical, so the standard lenses don't have one. The outer mount is for other lenses which have their own focussing device. The difference in price between a famous old M39 mount lens and its Contax mount variant is sometimes huge. If you want more than one of these lenses, think about buying this type of adapter. In theory the adapters should fit perfectly. Which indeed is the case for all my adapters except M39 and M42. These two adapters are adjustable, there are 3 screws which hold the ring with its M42 or M39 thread. In the first place this lets you turn the screwed-in lens to shift the reading marks towards the top. Just loosen the screws a little bit and adjust. Do this with your camera lying on its back, otherwise the ring and the lens could fall out. Rescrew. Check whether you can focus to infinity (~15m is not infinity! ), the lens being widest open. You should put 3 shims to have an even gap. It needs some patience. Rescrew the ring, look also for the right position according to your little pencil mark. Pull the shims out and tighten the screws again. Put everything together, focus should be fine now. It's a good idea to buy an adapter for each screw mount lens you want to use more often. Swapping lenses is much easier and quicker as well. And the Sony rear caps are easier to handle. If you can't reach infinity, i.e. infinity focus seems to be a little bit beyond the ∞ mark, it becomes more complicated, you have to sand down the ring. Please refer to the Russian lens page or for the Braun Paxette lenses to this page. 3 typical lens inserts and the 2 earlier mounts. Rear view. To protect the back part of the lenses, the inserts were screwed via the filter thread into the lid of a plastic container.